Skriv även vad du associerar med Elisabeth Sigmund. Vi svarar gärna på dina frågor om denna stora kvinnliga pionjär inom naturkosmetika. thank you for sharing your knowledge, your wisdom, your beauty and your style with us. You are an inspirational woman and I will carry this with me, always. Thank you for sharing your life story with me. I feel very privileged to have me you through my esthetician training at WALA and I honor your work and your intellect each and every time I use the Dr. Hauschka Skin Care products which are of your inspiration which were obviously given with a lot of love for nature and mankind. May you rest in Peace. 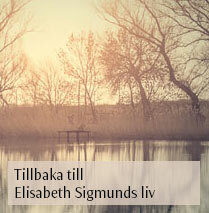 There is so much more to the world of Elisabeth Sigmund than cosmetics. It is a treasure what she created and I’m very thankful for this.